There are so many gluten free foods at Walmart Stores! Walmart is taking huge strides towards being a destination for inexpensive gluten-free food options. I don’t know how Walmart keeps their gluten free foods priced so low, but it is worth the trip to shop at Walmart!! Use this handy store finder to find a Walmart near you. 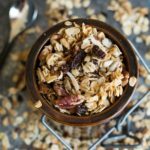 I shop at their grocery stores that they fondly call Walmart Neighborhood Market, but I have found many of the same gluten free foods at the Walmart Super Center nearby too. Surprised at these pictures? Walmart has TONS of gluten free foods. As you know from my popular Costco Gluten Free Shopping post, variety varies by store. I am working on a printable shopping list of all of the gluten free foods I found at my local Walmart. Check back soon! 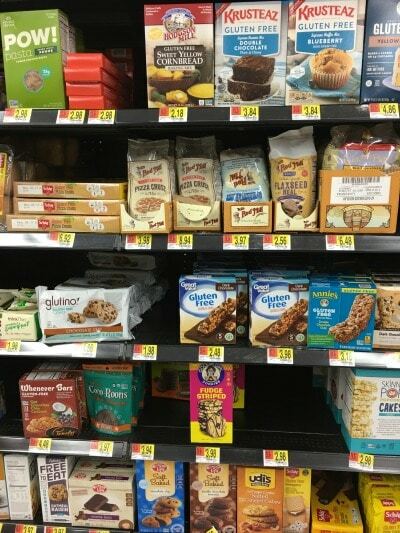 Can you believe how many gluten free products at Walmart there are? Our store pulled together a lot of gluten free foods and made an official Gluten Free Section! 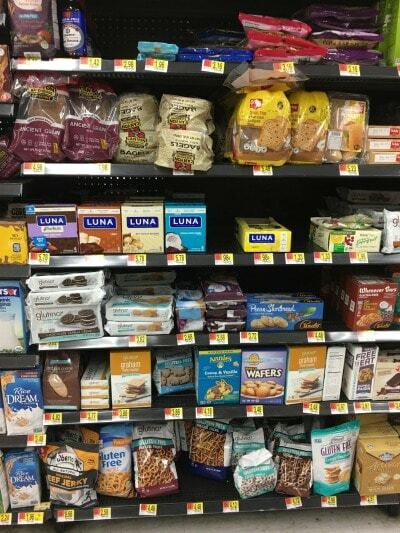 (There are still gluten free foods scattered around the store, but this is a nice big section that makes gluten free shopping at Walmart so much easier! The gluten free aisle goes from the right of this photo, almost to the other end! It’s about 12 feet long!! And wait until you see the prices!! Same brands as regular grocery stores, but much cheaper!! 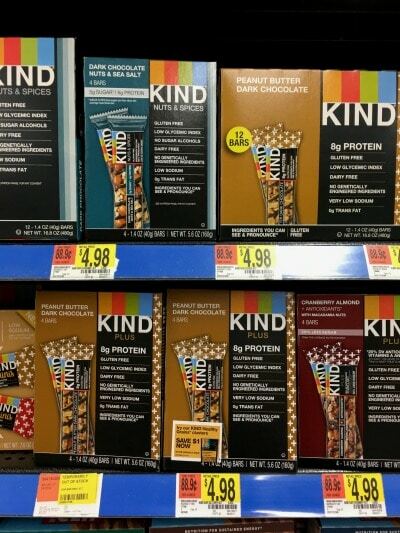 Glutino, Schar, Kinnicki, Udi’s, Canyon Bakehouse, all of the most popular gluten free brands are at Walmart. 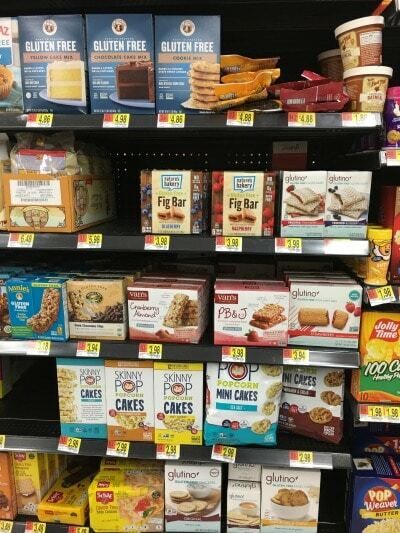 Here are some close ups of the Walmart gluten free section! There are of Gluten free flour Walmart, gluten free cookies Walmart, and gluten free snacks Walmart. Gluten free bread Walmart. 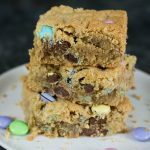 More gluten free snacks, gluten free crackers, gluten free cake mixes Walmart! (It took 4 pictures to get the whole gluten free aisle for you. 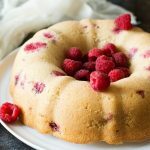 I wanted you to see all of the gluten free products! Gluten Free Crackers by Glutino and Schar, Glutino Pop Tarts, Annie’s Granola Bars, and so much more gluten free crackers. 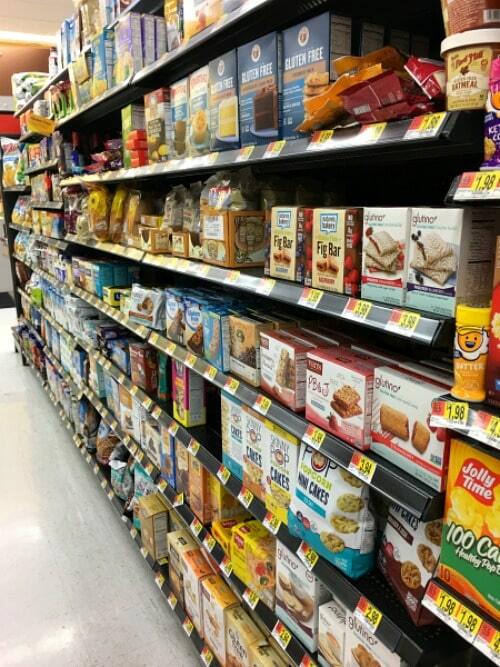 Walmart has so many gluten free snacks, it is hard to choose what to buy. A lot of these snacks would be perfect for a school lunch box too! I bought some of those Canyon House Bagels… can’t wait to try them. 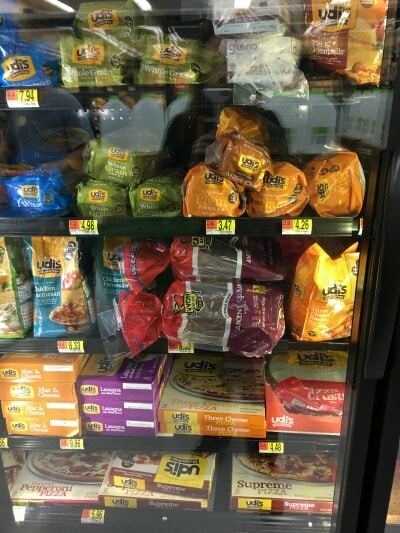 There are so many gluten free frozen meal options at Walmart. I didn’t get pictures of everything. These meals are perfect for busy nights when you don’t have time to cook. 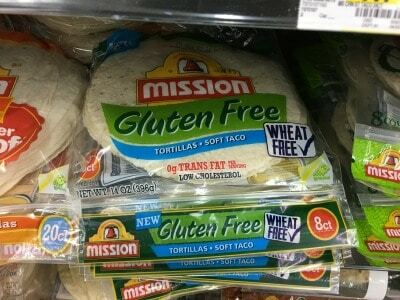 Gluten free products are everywhere! Lots of paleo prepared meals too if you are trying to stay grain free! 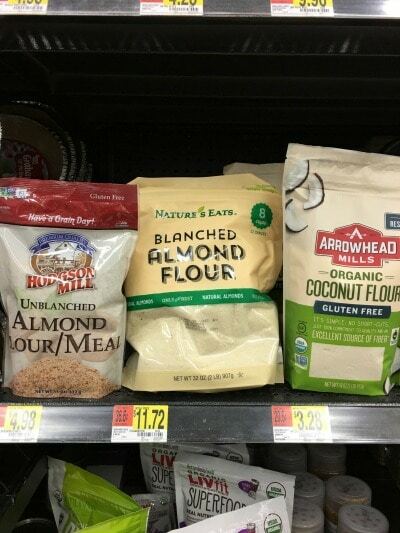 Who knew Walmart had paleo foods? They have an ENTIRE freezer case of paleo frozen dinners. Look at the prices too! 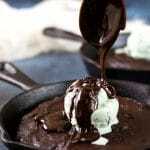 If you eat paleo, check out all of my Paleo Recipes. 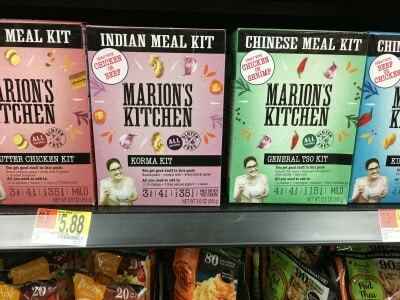 If you love Ethnic foods, these Meal Kits by Marion’s Kitchen are all gluten free. They had gluten free Chinese and Indian foods. 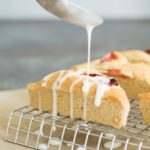 Walmart carries several types of gluten free bread. 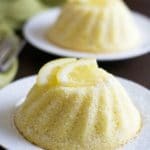 Udi’s, Canyon Bakehouse and more! Another big freezer case filled with gluten free frozen pizzas, gluten free frozen dinners, and gluten free bread! Almost the whole case was filled with Udi’s gluten free products. 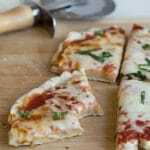 If you love pizza, you should try my Gluten Free Flatbread Pizza recipe! 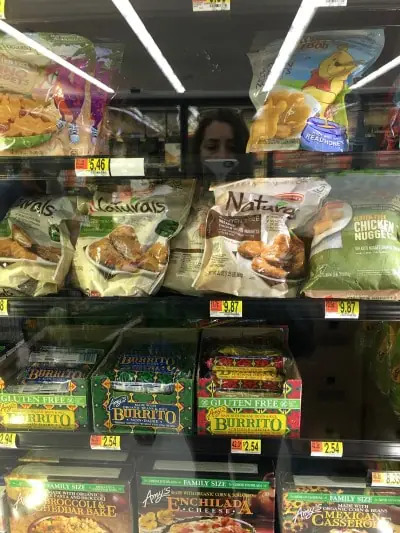 Walmart has several kinds of gluten free chicken nuggets, gluten free chicken tenders, and gluten free burritos. If you want to make your own gluten free chicken tenders, this Coconut Pecan Chicken Tenders recipe is delicious! 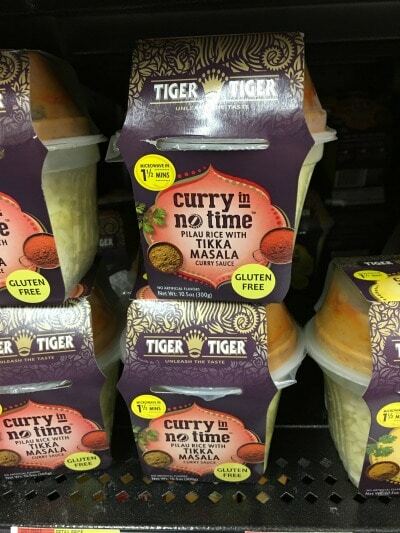 Has anyone ever tried these Curry in No Time prepared meals? 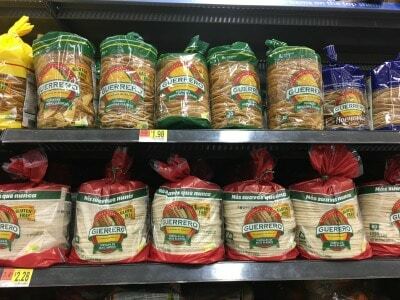 Walmart gets the best gluten free food variety. Freschetta gluten free pizzas used to be owned by a company called Sabatassos. You can read all about these pizzas here. Crappy picture, sorry, but yummy gluten free waffles. Aren’t these waffles $6 at other grocery stores? 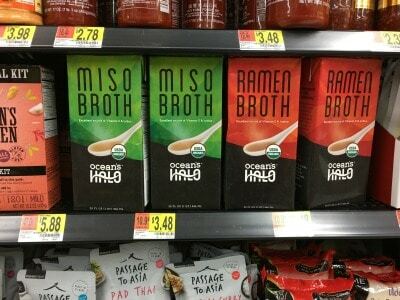 I can’t wait to try this gluten free miso broth from Ocean’s Halo. 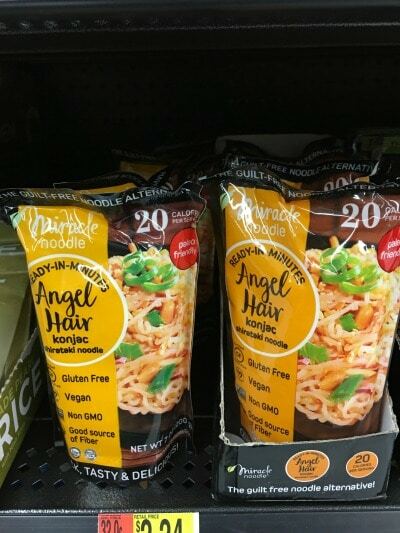 I have ever heard of Miracle Noodles, have you? They are gluten free, vegan, and non-gmo! 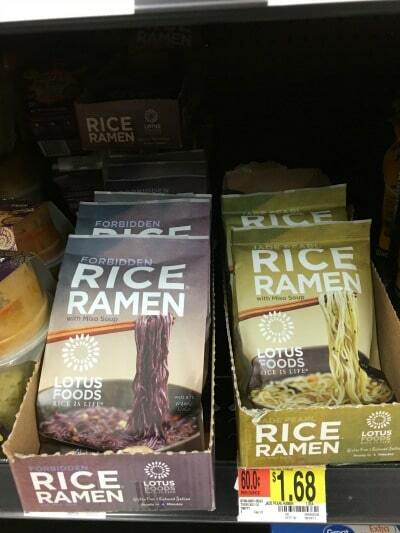 We tried these gluten free ramen noodles by Lotus Foods recently. My son definitely prefers the plain noodles where we can make our own broth. 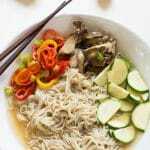 They are like cup of noodles, but much healthier! Guerro makes so many types of gluten free tortillas. Walmart has them all! 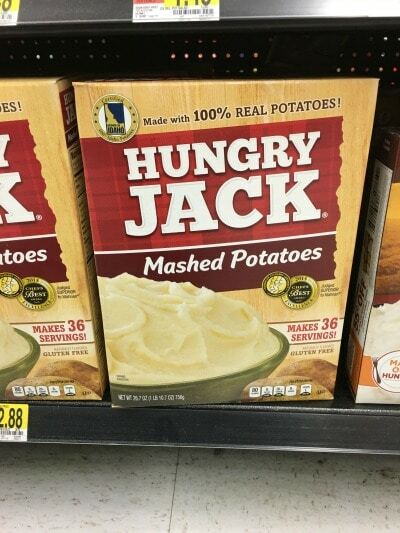 Hungry Jack gluten free mashed potatoes. 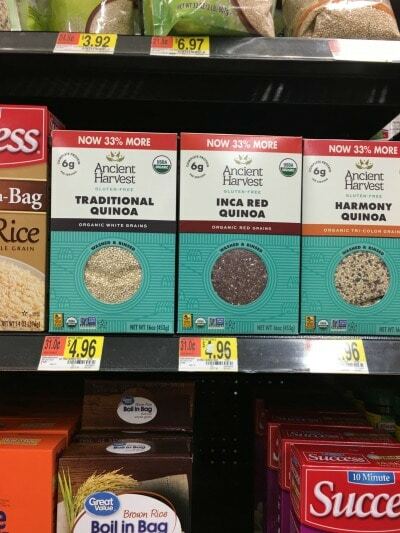 Not only do they have a large assortment of quinoa, but they also have several kinds of organic rice. 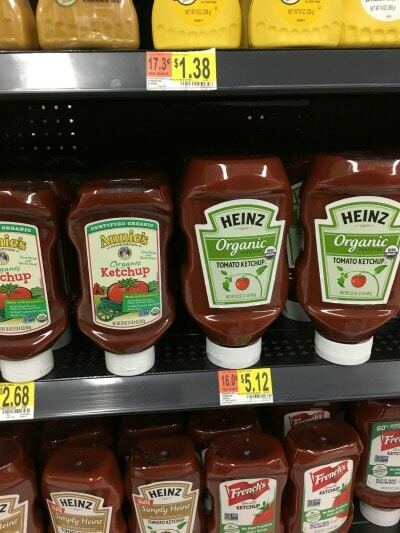 Did I mention that Walmart has a ton of organics? 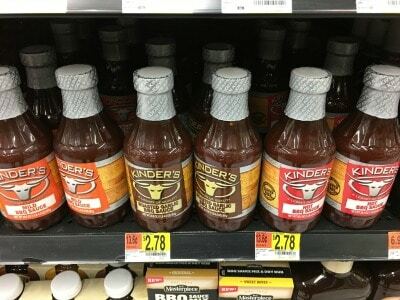 Gluten free Kinder’s BBQ sauces are our favorite! 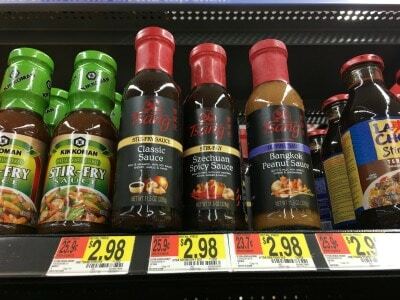 Have yu tried Tsang’s gluten free Asian Sauces? We love their peanut sauce! 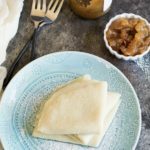 Lots of gluten free flours that I use all of the time! 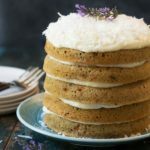 I love using almond and coconut flours in my baking. 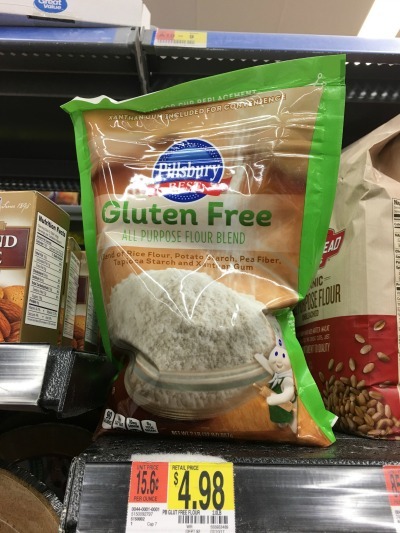 Not only do they carry several gluten free flours in the gluten free section of Walmart, they also have Pillsbury gluten free flour in the baking section! I also use coconut oil in many recipes. 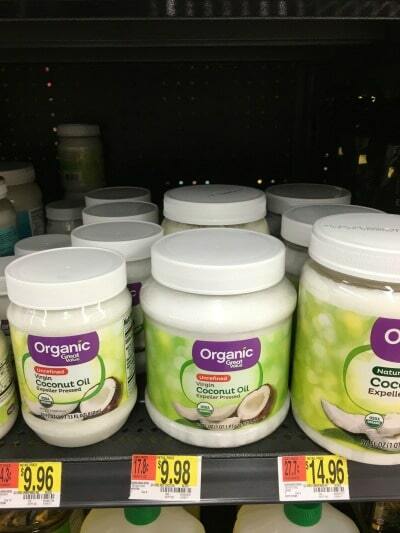 They have organic coconut oil at Walmart. 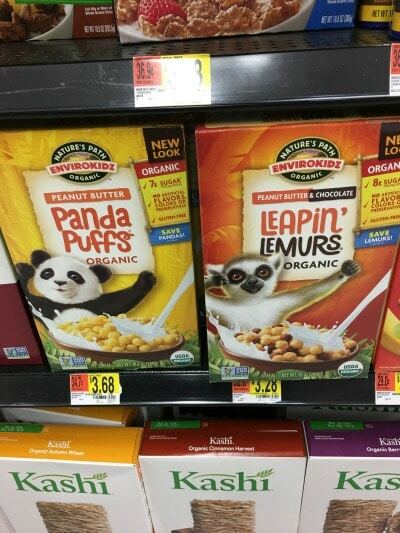 My kids love these EnviroKidz cereals. Can you believe these gluten free cereals are only $3.68? I paid a lot more than that at the other grocery store! 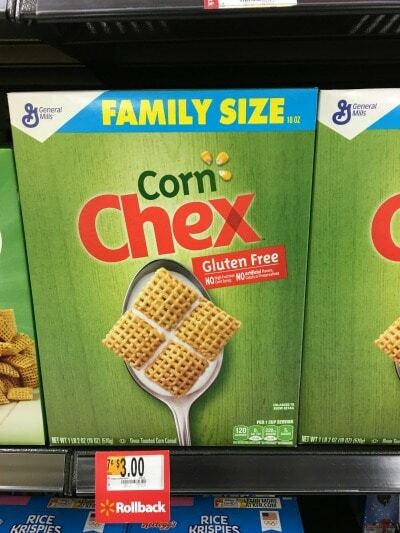 Walmart has all varieties of Chex gluten free cereals, and they carry several flavors of gluten free Cheerios too. In addition to the Lara bars and other gluten free bars, they also have these Kind Bars. Walmart is your place for gluten free food shopping! WHEW! 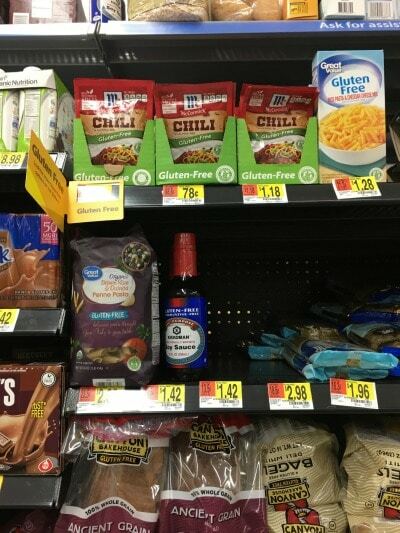 There you have it…Walmart gluten free products are everywhere!!! I will work on pulling it all together into a printable shopping list. If you see more gluten free at your Walmart, please leave a comment so I can add it to this list for everyone! i shop at horseheads ny and they stock all the gluten free foods that you posted..also they have the most polite helpful workers..i cant walk very far and they are so helpful to get me a battery cart ..i dont know what i would do without the wonderful walmart staff.. 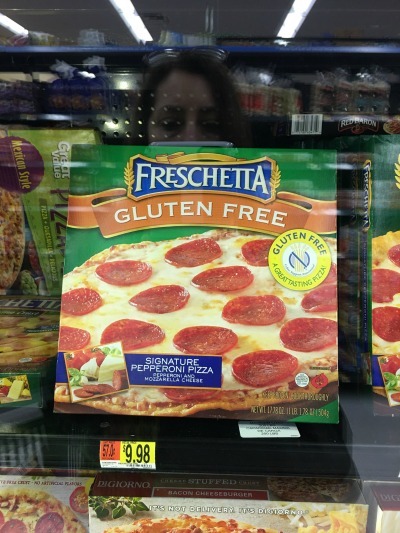 It still surprises me how Walmart can sell the name brand gluten free foods for so much less! Often stores don’t market the GF offerings or make them hard to find. By the time the word gets out in the GF community, the store has decided it is a waste of space and removed the items. This is very encouraging that you found such a great selection. I’ll have to check out my local Walmart to see if they have enlarged their offerings. On the items I have found, they have great prices! I wish our Walmart was like your’s. Our are removing gluten-free items and our gluten-free section is a 4 foot section. That is awful Mark, given how fast the gluten free community is growing, they are certainly going to miss out on a lot of sales by removing gluten free items! Perhaps you can order their gluten free items on their website? This is happening at mine too! That’s how I found this page, I was trying to find out if it was happening at all Walmarts or if mine was being cruel and this came up instead. 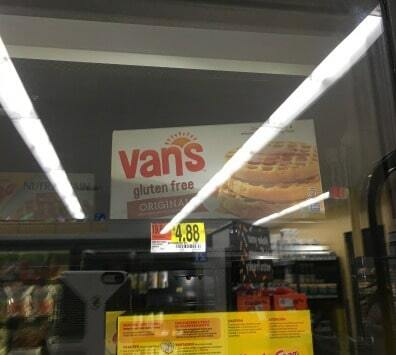 I have a feeling Walmart branded gluten free products are going to start popping up in their place and they wanted to remove the competition beforehand. I bet you are right Bree. We do most of our shopping at various Wal-Marts in the area. Our small-town store has a few things, but not the vast array you are describing. The store in Lincoln, NE (30 miles away), has a much more extensive stock. My best resource has been the Walmart.com shopping resource. I have been keeping a Word Document with everything I find, with the exact description so they can be ordered online or in the online shopping app, where you just pick up the grocery order. It is a huge list of products. I would be happy to work with you on this if you’d like. Not all the product will be available at all stores, but if we can give people a list, it should help. I am working with a family right now that has a child newly diagnosed with celiac. A friend of theirs contacted me to provide advice, since I was diagnosed almost five years ago. I don’t have a blog, so would be happy to work with you and then give these people the link to access it on your blog. Email me if you would like! I didn’t think to order from them online. I love this idea since products vary so much from store to store. Thank you so much Diane! This must depend on which Walmart you go to. I didn’t see a gluten free section at mine. I will check a few others in my area. Hi Jason, a few other readers have commented that not all Walmarts have pulled their gluten free foods into a separate section. The products may be mixed into the regular departments. Please let me know if this is the case where you are. I am not sure where you are located, but you can order some of the gluten free foods on Walmart’s website too. Have you seen and tried the Gluten Free Sam’s Choice Ancient Grains bread from Walmart? I found it in the regular bread aisle instead of among the gluten free products. It is my favorite so far! I found that I can actually make an enjoyable sandwich without toasting it first (assuming you have kept it in the fridge instead of the freezer). I haven’t seen those yet. I will have to look when I go next week. Thank you so much for your note Lu. Thank you for a job well done. I am thankful that Wal Mart has so many gluten free products at reasonable prices. I thank you for taking the time to do this project. Looking forward to your list. 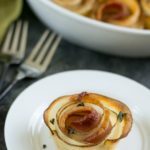 Your blog is a huge blessing for me as I eat gluten free also. Hi Summer, I am so sorry I haven’t had a chance yet. I will try to work on it this weekend. Thank you so much for your patience. Tonight I found at Wal-Mart their great value brand of cream of mushroom and cream of chicken soup!!! I keep telling people that they need to check out Walmart for gluten free/paleo stuff. It’s amazing to me how much stuff they have now and even their store brand gluten free stuff is fantastic. They’ve really done a great job with all of it. Wow you were busy at Walmart! I had no idea they offered so many gf options, fantastic! Hudson Mills GF cornbread mix is also rice free. I’m rice sensitive (waaaah) so I always stock up when I go. 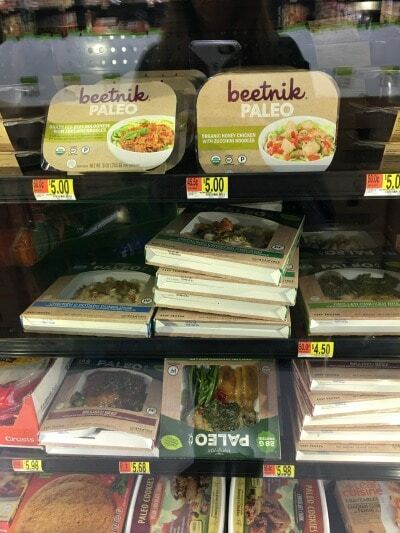 Some of the paleo frozen meals are ok… some are dreadful. The idea is awesome though. I didn’t realize their cornbread was rice free. This is great news for those trying to cut back on rice.